I do not cook. I mean, seriously, I am much better at prep work aka the chopping, than the cooking. I can throw together some easy meals, but I’m not adventurous at all in the kitchen, so most of the meals that I cook have a minimal amount of ingredients and steps in cooking and I usually use some sort of recipe. When I got a craving for my favorite from Boone Bagelry, the Tuna Pizza, I was pretty sure that I could do it justice: minimal amount of ingredients, pretty easy to make, and some chopping. I preheated the oven and started to make my usual tuna salad recipe (one can of albacore tuna in water, a tablespoon-ish of Duke’s mayo, chopped celery, and salt and pepper to taste). Once I mixed that all together, I set out to build my tuna pizza. 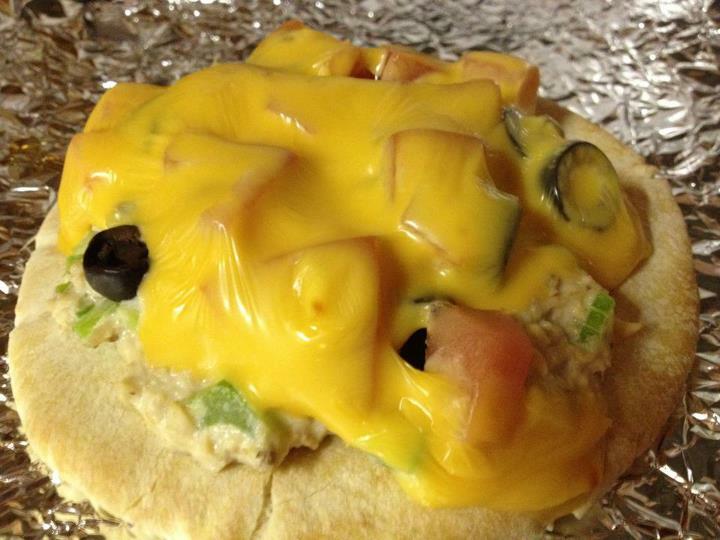 I placed a pita on a cookie sheet, piled on 2 scoops of tuna salad (about half the tuna salad I made) and topped it with sliced black olives and some fresh, diced tomatoes. The last thing to add is the cheese of your choice. I opted for American cheese, not my favorite, but it was the only cheese we had that made sense for the pizza. I popped the pizza in the oven and waited for the cheese to get gooey and the tuna salad to warm-up just a bit. I was totally happy with the outcome! It was just like I remembered it from my college days at Appalachian. The crunch from the celery, the salty briny taste of the black olives, and the gooey cheese made for some perfect bites. It was also a nice alternative to my usual weekend tuna salad sandwich. And I have enough tuna salad left over for my lunch tomorrow, even better. I’m not really sure how “healthy” this one is, but I think I figured out the calories, using the recipe analyzer, to be right at 45o calories. You can alter the recipe to make a healthier version, but since I’m not a cooker, I’ll have to stick to what I already know, but if you have a healthier version, please share! I am great at following recipes. I decided to create a new area on the site dedicated to sharing healthy recipes with one another. I hope everything will jump on the bandwagon and share some of their faves! I discovered this recipe last summer after Katie & I had bought several bags of frozen shrimp on sale and needed a different dish for them each week. We had most of the ingredients already, so it was a no-brainer. The home-made sesame dressing is really light and accompanies the salad perfectly. If you haven’t tried jicama before, don’t omit it. It adds a great earthy-sweet crunch along with the celery, while the shrimp, grapes and cucumber balance out the other end of the texture spectrum. 1. 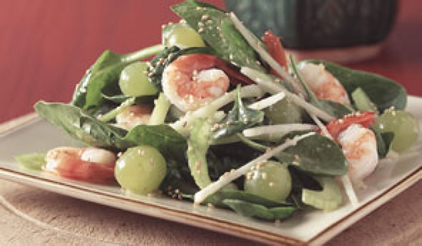 In a large bowl (remember it’s 16 cups of spinach), toss together spinach, grapes, shrimp, celery, jicama, cucumber, & green onion. 2. Prepare Sesame Vinaigrette Dressing by combining all of the ingredients in a blender and pulsing until emulsified. If you have one, an immersion blender works even better, encouraging the oil & vinegar to hold together instead of separating like it wants to do. 3. Cook the shrimp. I love the taste of grilled shrimp on skewers, but it’s an awful lot of work for 5 minutes of cooking time. So, I typically just sauté the shrimp in a little bit of butter. Cut the fat a little by just using fat-free cooking spray. The sesame dressing for the salad will help season it, so no need for any extra salt or pepper (in my opinion). I prefer the shrimp to still be warm/hot when I put them on the salad. If you prefer room temperature or even cold shrimp on your salad, this step can come earlier. 4. Toss together salad ingredients, shrimp, and vinaigrette. Top with toasted sesame seeds.